Minor Pentatonic Scale and Power Chords is part 11 in a 14 part series on Learn to Play Guitar Lessons. This scale is the most popular of guitar scales used in rock music. It is used for improvisation in almost all styles of music but it is most commonly played over rock chords and power chords. Below is a video that describes how this scale is used and the chords it is played over. The minor pentatonic is a 5 note minor scale that is the most popular of guitar scales played over rock music. It's also the scale used to create many memorable pop and rock melodies. The minor pentatonic is: do, me, fa, sol, te or 1, flat 3, 4, 5, flat 7. You don't play the 2nd or the 6th (or re and la). You skip over them. This gives your improvisation a real rock sound. If you were in the key of A minor, you could use an A minor pentatonic scale. If you were in the key of C Major you could also use it because A minor is the relative minor to C Major. *The relative minor scale in any key is taking the major scale and starting on the 6th scale degree or "la" and going up a full octave. Below is the C major pentatonic versus the C minor pentatonic . Rock chords can be any chord on the guitar. Pop and rock are constantly absorbing more complex harmonies. Typically rock chords consist of triads (3 note chords), however pop uses a lot of jazz voicings which are typically 4 note chords. Power chords are 2 note chords consisting of the root (or 1st note) and 5th of the chord or the scale. Here is a list of all available power chords on the guitar. Often a power chord is notated as follows: C5, D5, E5 etc. 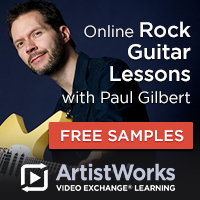 Check out this instructional video with Paul Gilbert (Racer X, Mr. Big), one of the world's greatest rock guitarists. He has an excellent program which is worth viewing. This guy rips! Thanks for visiting Minor Pentatonic Scale and Rock Chords. Now let's check out "the blues"!